I have always had odd sleeping patterns. I'm a self-confessed night owl, always feeling more productive at night and for as long as I can remember I've always stayed up until the early hours of the morning. When I was younger I stayed up late with my head buried in books, in University I stayed up late because, well, that was the done thing to do in University, and now? I stay up late with my head buried in books. It's naughty, really, staying up so late and depriving myself of much-needed sleep. Back at University we studied sleep psychology and I learnt how important it was to get a good night's sleep, and how dangerous sleep deprivation can be - yet I still chose to stay up late. Thankfully I don't work in the morning's and so I can still make sure I get the recommended 6-8 hours sleep a night, but getting off to sleep itself is always a bit of a challenge (especially if I'm getting stuck into a book I don't want to put down). 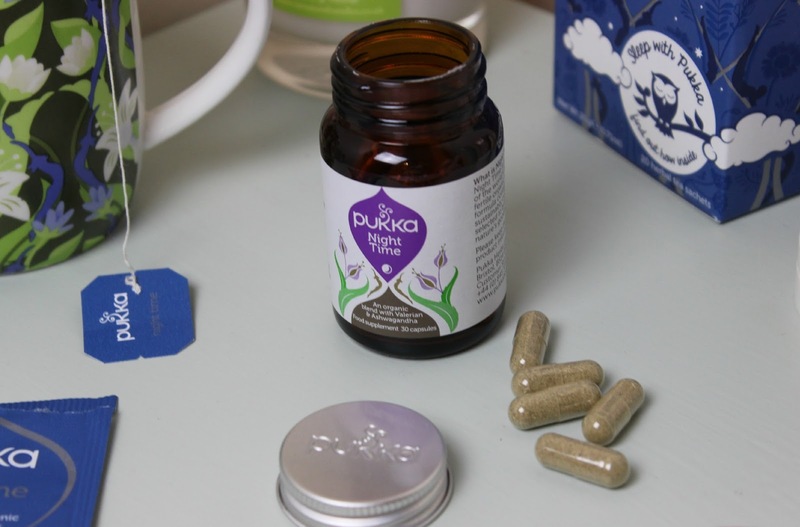 I was recently contacted by Pukka Herbs and asked if I'd like to try some of their night-time products to help me get a proper night's sleep with ease. 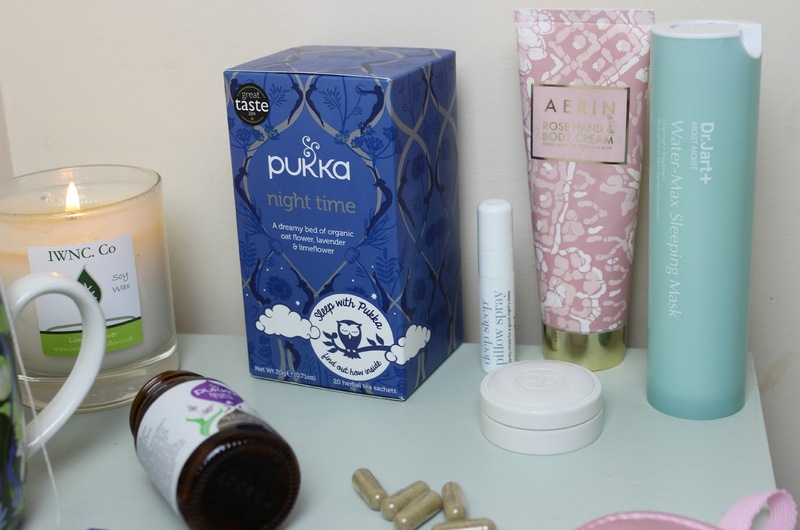 I was very kindly sent a lovely sleep hamper (see this Instagram photo), including lots of sleep themed treats which I've been getting stuck into over the past couple of weeks, all in the hopes of drifting off easier for a long, peaceful sleep. One thing I never fail to do before bed, is pamper. Cleansing away the day, putting my night time skincare on and indulging in a few night time specific beauty treats. I always make sure to pop on a thick and moisturising hand cream, my current (and long time) favourite is the AERIN Rose Hand & Body Cream, as I enjoy using something a bit more nourishing at night to ensure I wake up with super soft and happy hands. Something else I like popping on just before bed is an overnight mask and over the past few weeks I have rekindled my love for an old favourite; the Dr Jart+ Most Moist Water-Max Sleeping Mask, applying a generous amount to awaken to hydrated and supple skin (full review here). Lips need a pamper too - and I'm currently using up my beloved Dior Crème de Rose Smoothing Plumping Lip Balm, which smells absolutely divine. Beauty treats aside, I've never really set myself a wind down routine at bedtime. When you're used to being up all night, you don't really consider the things you can do to help you wind down. That's where Pukka Herbs have come in - encouraging me to do and try things which can help me get a better night's sleep, without having to count sheep to get it! 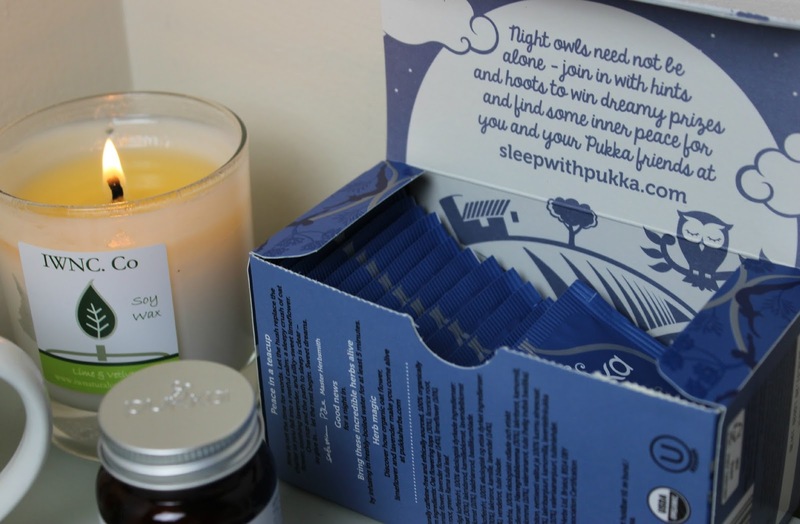 My Pukka Herbs sleep hamper included everything I needed to get going on my mission to better sleep. There was a box of Pukka Night Time Tea; a box of 20 individual teabags made with 100% natural organically grown ingredients, some Pukka Night Time Supplements; an organic concentrated herbal blend with some of the world's finest herbs, a Pukka sleep journal and a 3 Steps to Easy Relaxation CD, all of which aim to help promote a deep and peaceful sleep. The Night Time Tea is by far my favourite find from Pukka Herbs. I've almost finished my box now and will definitely be repurchasing, as not only have they helped me drift off to sleep easier, but they are by far the nicest and easiest to drink night time tea I have tried - and I've tried my fair share! Ingredients wise they're very natural and simple; Oat Flowering Tops, Liquorice Root, Chamomile Flavour, Lavender Flower, Limeflower, Valerian Root and Green Rama Tulsi Leaf. The chamomile definitely makes a difference compared to other herbal night time teas I've tried, as it gives it a lovely but very subtle sweet twist. Almost as soon as I start drinking my night time tea each night I start to feel more relaxed, as if my entire body and mind is starting to wind down - within the hour I'm struggling to keep my eyes open and falling asleep! I definitely recommend giving these a try if you've been after a tasty night time tea. I've also got a lot of use out of the Night Time Supplements; with key ingredients of Valerian and Ashwagandha Roots alongside Gotu Kola Leaf, Hawthorn Berry, Nutmeg Fruit, Bhringaraj Leaf and Fennel Seed. I've tried sleep capsules before and I find them very, very effective. I don't feel the need to take these every single night, as most days the tea is enough to get me ready for sleep - but on those days where I've been feeling a little stressful and know I'll really struggle to shut my brain off, these massively help. You simply take 1-2 capsules and let them do their magic! I find when I've had the capsules alongside the tea, I end up having the most amazingly deep sleep you could ever imagine. It really helps me to wake up feeling refreshed and as if I've had a proper and much-needed sleep! 1. Aeroplane Mode is your best friend: Turn those gadgets off! Phone, tablet, TV, the lot. I make sure that as soon as I get in bed my phone goes straight on aeroplane mode, the TV is off and any tablets are left in the office away from arms reach. Not only does it stop me staying up all night glued to my phone, but it stops me being tempted to check and reply to tweets and emails throughout the night. 2. Blackout: Although it's nice to wake up to natural light (and much easier to get out of bed, too), it's far easier to drift off and stay asleep if your room is completely dark. We have blackout blinds which I find so, so helpful, and I turn to my Lumie Bodyclock for that sunrise effect in the mornings instead of having our blinds open. When our blinds are down, the room is dark and the light from outside is blocked out; lamp posts, the moon on nights when it's super bright and lights up our room with ease, I find I get off to sleep much quicker! 3. Cold feet: Just like having a dark room, having a colder room is much better for getting off to sleep and staying asleep. I'll be going more in-depth on this soon in a Psychology based post on sleep, but each night around 10pm I make sure the radiator in our bedroom goes right down in temperature, if not all the way off. Trust me, give it a try and you'll find yourself tossing, turning and waking up a lot less throughout the night! What do you do to make sure you get a good night's sleep? 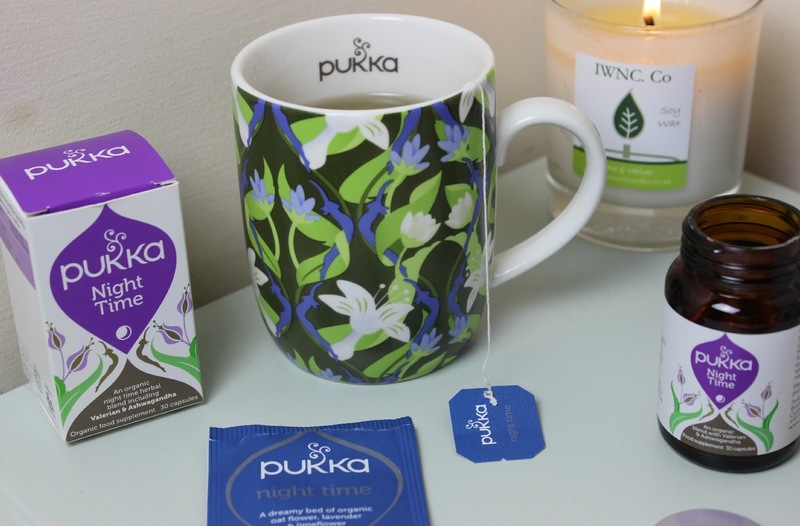 For hints and tips on achieving your perfect night's sleep, I really recommend checking out Sleep with Pukka over on the Pukka Herbs website. And if you have any tips and tricks of your own, I'd love to hear them! I love Pukka teas! Haven't tried this one yet though, definitely gonna give it a try! i'm such a bugger for being on my phone before bed, I need to overhaul my routine because I rely so heavily on using my phone to tire my eyes out and i know it's not a good idea at all! Totally agree with the body temp thing because I know I can't sleep in any clothes at all and we always have a fan on 365 days a year because for whatever reason I get REALLY hot in bed and I couldn't think of anything worse than having anything on my feet! !